This fantastic Old Mill 2 bedroom 2 bathroom cabin has lovely wooden interior walls throughout. The comfortable furniture is perfect for stretching out in front of the stacked stone gas fireplace, and watching TV or visiting with family. With fully equipped kitchen, there will be no reason to venture out of the cabin. The bedrooms have beautifully designed wooden king and queen size beds with both bedrooms offering an alluring stacked stone Jacuzzi, for those romantic evenings indoors. Take advantage of the rockers or swing on your front deck and take in that fresh mountain air. Let your worries disappear as you soak in the bubbling hot tub. Echota Units are less than 1 mile from Sevierville Golf Club and Wilderness Resorts Indoor/Outdoor Waterpark! This cabin was ideal for the number of people in our party. It was so well maintained and prepared that, from the moment you entered you felt at home. Right from the delightful fragrance to the soaps and candies and how well everything was presented for your guests. Your very professional staff beginning with Kelly, was extremely appreciated and answered all our needs beautifully. You had me at “hello.” Next time we plan a visit to this area, you can count on a booking from myself and my family. The jacuzzi was a wonderful added touch especially after days being spent doing all sorts of fun things offered in this area. Thanks again for making our vacation a memorable one. What a wonderful cabin. The master bedroom was very nice with a king bed and tub with shower, not to mention the Jacuzzi (fantastic). The 2nd bedroom has a double and no bathtub, but again, Jacuzzi was great. The only thing to make the gas fire place better would be a blower. Back porch had a hot tub which was very nice at the end of a busy day. Will we be back? YOU BET. We truly enjoyed our stay 20- 23 Nov 2013. The cabin was easy to find with the directions provided. It is right off the main highway but feels like you are in a secluded location. It is an easy drive to all the tourist locations. The cabin was great! It is decorated beautifully with comfortable furniture. The hot tub was great! Our booking came with breakfast for 2 at the Old Mill Restaurant. It was delicious, and there was alot of it. We walked around the Old Mill Village and it was very nice. I wanted to buy one of everything in the Pottery Store. We went to the Dixie Stampede Christmas show and it was very good. I recommend going to this. We also walked the streets of Gatlinburg and shopped quite a bit. We will definately be going back! What a wonderful place to stay. Kelli with Old Mill Lodging is simply the best. We have been traveling for years and have never felt so assured that everything at the cabin would exceed our expectations. Clean, well cared for, and all the comforts of home. This was our second stay and second cabin, both being marvelous and selling us on where we would stay next time we visit Sevierville later this year! My husband and I stayed at Echota 10 for our honeymoon. It was great we couldn’t have asked for a better place to stay. It was a nice area where the cabin was located. It was far enough away from the busy highway and quite but close enough to go out to do fun stuff. We will definitely be going back in the future. We found the cabin with no problem using the address in our gps. The cabin was beautiful inside and out just like the pictures I viewed on line. Landscape was very well maintained with flowers blooming by the steps walking up to the rustic front porch with rocking chairs and swing. It was the most peaceful vacation my husband and I have every enjoyed. We plan to return next year to enjoy it again. We enjoyed the Gaithers 3 day concert also, it was the first time we had seen them and it was wonderful. They have numerous restaurants to choose from, we liked Bubba Gummp’s shrimp dishes, they were very tasty. I have shown pictures of our trip to several friends already and they cannot wait to make reservation and enjoy some of the same things we did. All the comforts of home in a cozy cabin off the main highway. The king size bed was so comfortable and great for sleeping in late. Evenings relaxing in the hot tub enjoying wine were fabulous. Gas logs are nice and keep living room area warm. We are really looking forward to our next getaway. This cabin was the perfect little spring break getaway for us. Extremely clean and everything in working order. The Hot Tub was perfect for a cold and rainy night. Location to Pigeon Forge and Gatlinburg is perfect as you stay away from the craziness but only a 10 min drive to the action. We will be returning! WE HAD A WONDERFUL STAY FOR A WEEK.THE CABIN WAS SPOTLESS AND WHAT A VACATION . WE SHALL RETURN THIS YEAR AND THIS BEATS TIME SHARE IN EVERY WAY.. The description and pictures of the cabin were true to detail. My Sister and I wanted a restful getaway with the flexibility of being able to join the Pigeon Forge/Gatlinburg festivities, without being in the middle of them. We got just that. We each had our own room with private bath and whirlpool, so that if one of us just wanted to “sleep-in” we had that convenience and luxury. The cabin is far enough from the main highway so that you aren’t hearing that traffic noise, and conveniently located just up the street from a major grocery store, popular restaurants and local eateries in case you don’t want to cook. It is within a 15-20 minute ride, depending on traffic, to the major festivities in Pigeon Forge/Gatlinburg. You have the convenience of sitting (four rocking chairs, a glider and a porch swing…so there is no waiting…:) ) on the front deck and enjoying nature, reading, taking a brief nap or… going inside and watching television, since there are 3 in the cabin, both bedrooms and the living room. My sister and I enjoyed spending some quality Family time together. Even though the outside looks a little rustic when you first arrive, the inside is BEAUTIFUL!!! It is very clean and tastefully decorated. I would definitely recommend this cabin to anyone for a get away and would go back there. The cabin was wonderful. It was exceptionally clean and we all had a great time. Our grandson was with us and really enjoyed the stay, as we all did. The hot tub was also great and seemed much cleaner than those of several other cabins we have stayed at previously. We would highly recommend these cabins to others. Very clean and comfortable cabin. Thoroughly enjoyed our stay. Very convenient to I-40, Sevierville, Pigeon Forge and Gatlinburg. 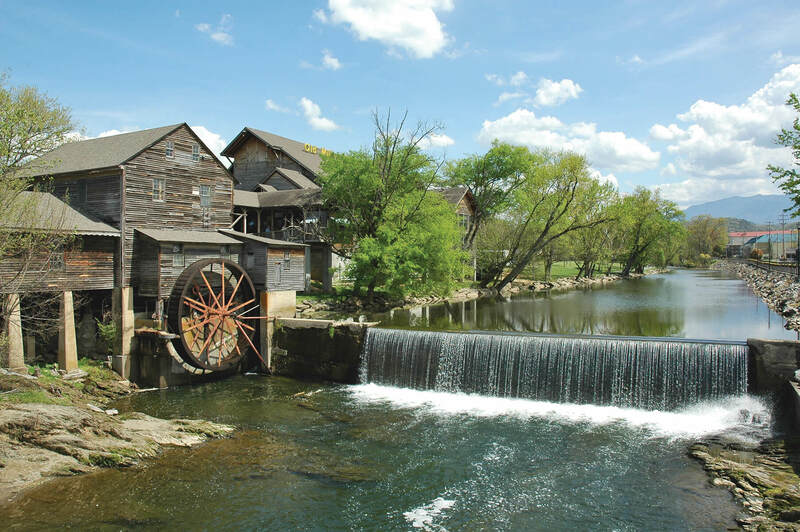 The Old Mill Restaurant in Pigeon Forge is excellent. A trip to Old Smoky Candy Kitchen in Gatlinburg is a must. The Christmas Place is a must see anytime of year. Would recommend this cabin to others and will probably make a return visit ourselves.